“5 Broken Cameras” is up for an Academy Award in the category of Best Documentary Feature. Here’s hoping that “Oscar” can help promote interest. Click here for an interview with the Israeli and Palestinian directors. Sweet Sistine: our best bet is always on God! You knew this had to happen. I am just jealous I did not come up with it first. To me it looks like the “odds” are favoring: (1) Turkson, (2) Quellet, and a tie for (3) Arinze and Scola. Remember, though: God is full of surprises. It is ours to try to see things God’s way, and not the other way around. Our best bet is always on God! There is a local flavor to this bracket, designed, obviously, by someone from the Dubuque-Dyersville area. This visual points to the reality of the human dimension of the process of the election. It is always our approach that “grace works on nature.” God decided to take on human nature for our benefit. Why will God not use our human nature to further the divine plan for our salvation? My prayer is simply that the Cardinals do not mess up what God has in mind, or get in the way of what God is doing. (That is my most frequent and sincere prayer for myself.) May the electors truly allow themselves to be influenced by their prayer for guidance from the Holy Spirit. God will work with whatever the Cardinals decide and with whomever the Cardinal elect. That is God’s promise! Some will find the “Sweet Sistine” funny. Others might find it disrespectful and call it sacrilegious or blasphemous. Let us be grateful, nonetheless, that the retirement of Benedict XVI and the fascination with the election process for the next Pope brings such attention to the Roman Catholic Church. 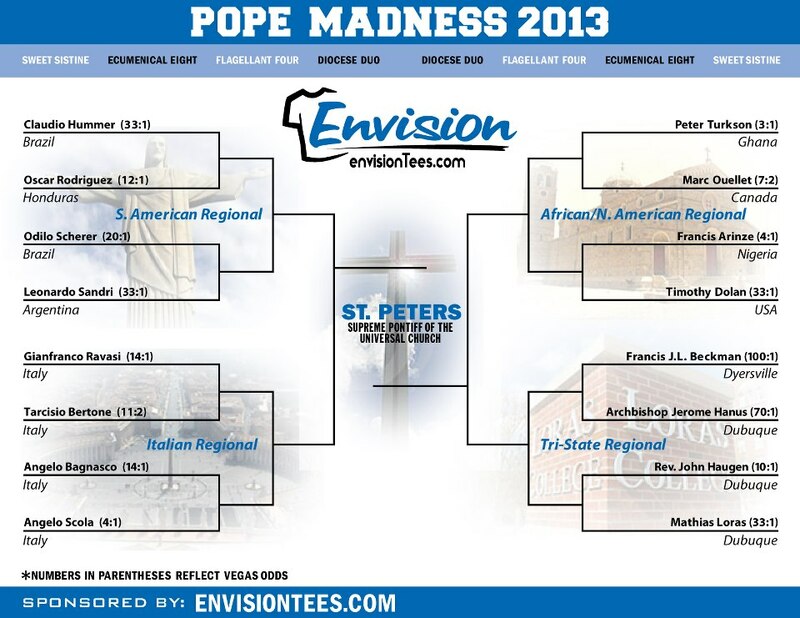 And let us keep good humor about such things as this bracket, for, as is sometimes said, “Any news is good news.” It gives others the invitation to think about the Church, no matter what they think, and it gives the Church an opportunity to think anew about herself. 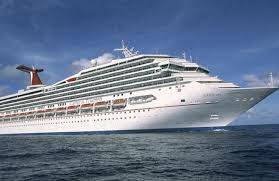 Living in the sight and smell of feces and urine, with raw sewage at their feet, limited water, not much electric, no heat or air-conditioning, and not enough food – this is not what the people on the Carnival Triumph cruise ship had signed up for. This was no way to live. They deserved better. It was unacceptable. Yet this is how they spent their Mardi Gras and began their Lent. In communication with loved ones by cell phones many gave accounts of the good service of the crew. They spoke about how they were making do with what they had (or didn’t have). They lived in hope and trust that their ordeal would eventually be over. As we begin our Lent and ponder how disgusting it must have been to live those days on the ocean liner, we remember that there are people in the world who live that way all the time: the way human beings are not meant to live. There are people who never have utilities and facilities, who are always without water, food and electric, and who are without any hope that their ordeal will come to an end. This is unacceptable. 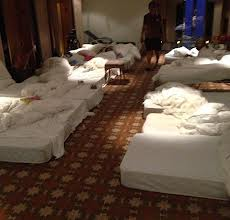 Maybe this event – and this Lent – will make us more grateful, when we flush the toilet, turn on the lights, open our refrigerator and make our beds. Maybe this event – and this Lent – will find us more inclined to be of good service to those who do not have something that they deserve. Maybe this event – and this Lent – will cause those of us who stand on the shores of comfort or cruise through life in luxury to catch a glimpse of the suffering of others. Maybe in the next forty days we will be shown some way of working toward fixing things and making things right for someone else. 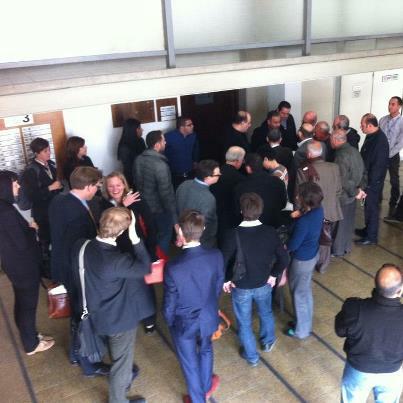 On Tuesday, 12th of February 2013, the final hearing for the case of the Cremisan Valley against the Separation Wall was held in front of the Special Appeals Committee in the Magistrate Court in Tel Aviv. Our friend, Father Ibrahim Shomali, the Parish Priest of Beit Jala, was in the crowded courtroom to observe the proceedings. 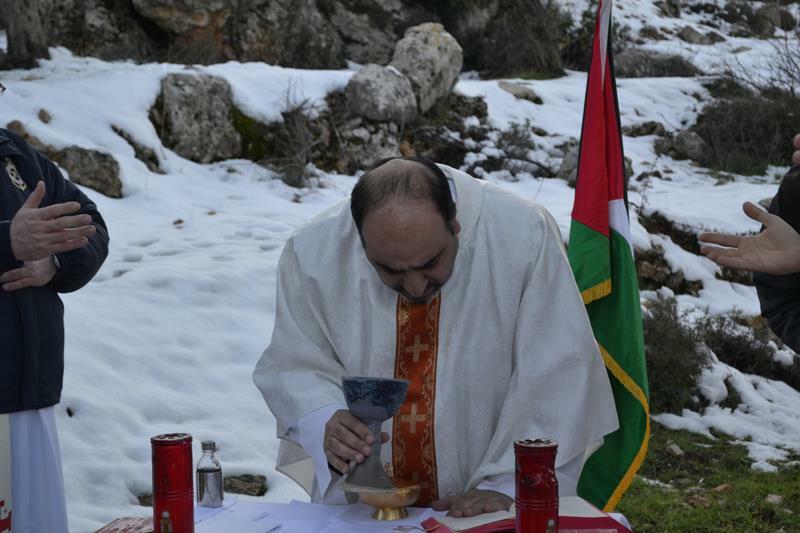 The Catholic auxiliary bishop of Jerusalem was also present. A summary of the testimony of both sides is provided by the Society of St. Yves Catholic Center for Human Rights. Obviously, the summary is of a tone that favors the case as presented by the side opposing the building of the wall. The session ended with no decision by the court. It will be issued after the committee reviews the documents of the case that has gone on for seven years. When my mother was still with us, I could count on one Valentine. In the mail, year after year, I would receive one of those simple (read: cheap) Valentines on flimsy paper, with the perforated edges indicating that it was one of a sheet of Valentines. It was the kind that I remember being passed around in the first grade. There was no breath-taking or tear-bringing message, like the ones we see on the jewelry and perfume and candy commercials. It would be signed simply with her heartfelt, “Love, Mom.” But mom is gone now for six and a half years. No more Valentines from her. 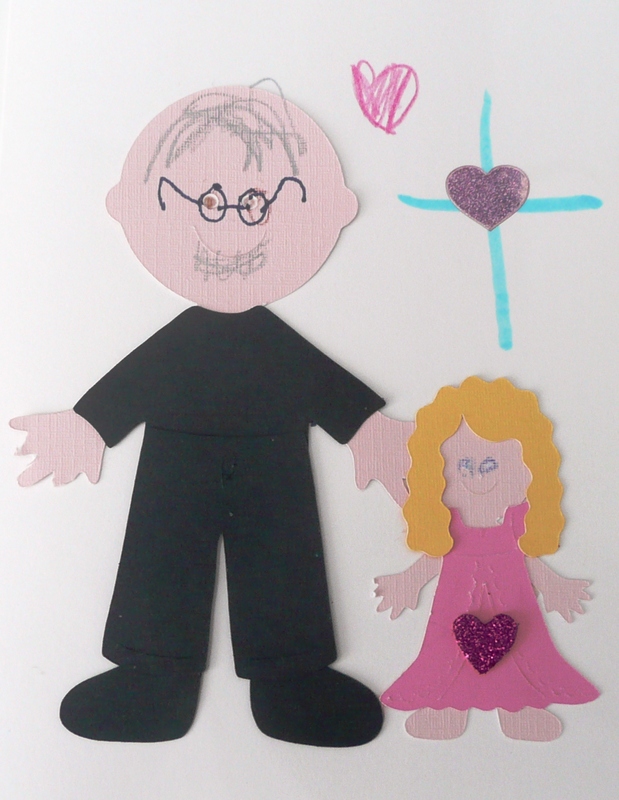 There is the cutest little blond girl in our parish, six and a half years old. 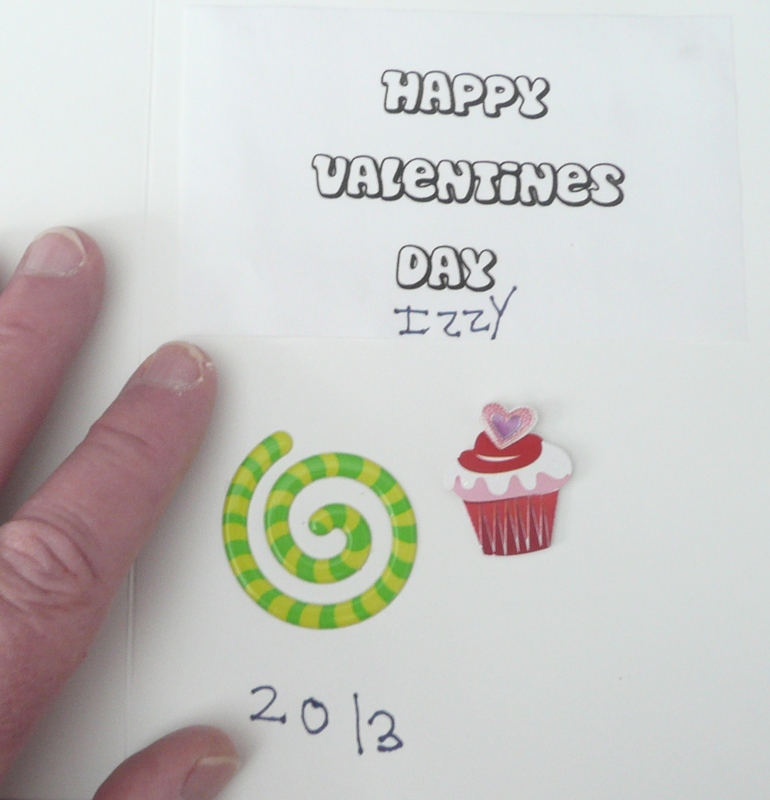 She has taken to making me and bringing me a Valetine’s Day card every year. It so happens that she was born on the day that my mother died. Without her parents knowing me six and a half years ago, and knowing nothing about my mother, they gave their daughter the name, “Isabelle.” That was mom’s name. And they call her, “Izzy.” That is what my sisters and I called mom. Izzy brought me a Valentines’ Day card today. I smiled. Izzy smiled. My mother smiled. We are made from dust, but we are not meant for earth. We are meant for heaven. Lent begins, but Easter beckons. With Christ let us rise from the ashes of this day!